There's something I need to show you, here on Life with Lynnie (LwL). It's not something to hurt anyone by. It's just something that will educate people on truth. Did you read those verses from the Qur'an? Are you wondering why I showed you this? To be honest, I have tried to always speak truth. Yet, so many people think that I'm not telling the truth regarding what the Qur'an teaches Muslims. Please realize that EVERY Muslim is taught this through the Qur'an, and through teachings by their Imam's (Islamic pastors/ministers). Yes... E...V...E...R...Y... Muslim. So, are you thinking I'm putting down Muslims? Hopefully, you don't think this, because I'm letting you know that not every Muslim does what their god wants them to do, just as these verses in the Qur'an state. If they all did, they would all be what government officials would call terrorists. 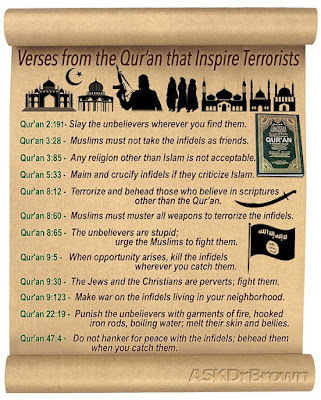 After all, everything stated in that photo showing verses from the Qur'an are things that terrorists are doing. Not just in one (1) country, but in many and various countries in the world. So, as I heard someone else say, it is what terrorists do. But, not all Muslims do it, even though they are taught that their god wants them to do it. Is it different being Christian? Not everyone who claims to be Christian is doing what our God wants us to do. Many people who claim they are Christian do not read His Word, the Bible. Many also do not worship. Or, pray. Some people decide that even though they love Jesus, our Lord, and have been forgiven by loving Him, they feel it is okay to sin. We all need a relationship with Jesus. If we truly trust Him and believe upon Him, we will begin to have a relationship with Jesus and will gain salvation. Plus, as we do what God wants us to do, our relationship grows closer to Him, with less and less sin. People who are truly born-again Christians don't want to sin. Just as we read, in 1 John 3:9, "Whosoever is born of God doth not commit sin; for his seed remaineth in him: and he cannot sin, because he is born of God." Amen! Whoever is born of God doth not commit sin; for his seed remaineth in him: and he cannot sin, because he is born of God. If so, you do not belong to God, for you are sinning. Please, come to Christ. Today.